Hi everyone! The experience of the two last updates wasn’t so smooth; the bigger the update is – the more problems it may potentially cause, and something that works fine on my testing environment may crash on other WP installations. Therefore I’d like to find several people (3-5 would be enough for now) for “beta testing”. Hi, our beloved wpDataTables users 🙂 Today I would like to publish a brief plan/schedule of plugin development for the end of 2014, so you would know what awaits you in nearby future. As usual, update started as a small patch/bugfix routine, but ended with a bunch of improvements, new features, and so on. Check out what’s new page of the site to see the full feature and fixes list! 1.6 with even more is coming (relatively) soon! Update procedure is described here. 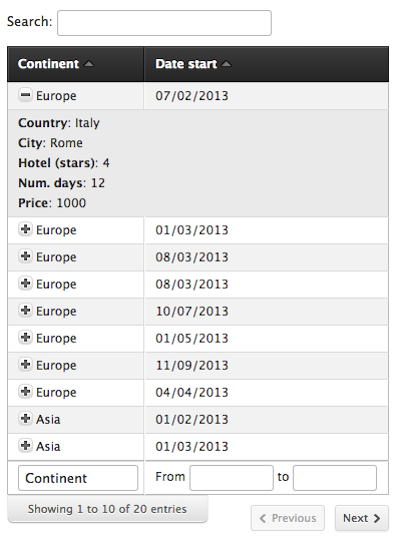 This is a free basic version of wpDataTables Tables and Charts WordPress plugin. Some of the features available in the full version are cut, but wpDataTables is still quite a handy tool which will allow you to quickly create interactive tables from a number of sources: Excel, CSV, JSON, XML, Serialized PHP Array. The interface and the instructions how to use it are absolutely same as for the full version of the plugin. Please see the documentation on how to create tables in WordPress from different data sources here. We have two good news on wpDataTables! First one is that we finally published a PDF version of documentation (will be included with the plugin from now on). It has more then 160 pages, and it explains all the plugins features with illustrations and in complete details. You can download it here.